Miracle Method of Salt Lake City Owner Gabe Gilliam is expanding and adding new territories around Salt Lake City, UT. 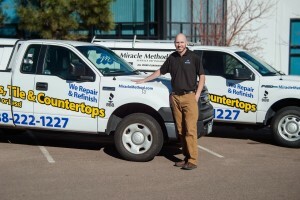 Due to the positive economic growth several franchises at Miracle Method Surface Refinishing, the nation’s largest professional bathroom, and kitchen refinishing franchise, have expanded territories as owners position themselves for growth in 2019. On the opposite side of the country, Tyler Murphy, who owns multiple units in San Diego, CA, Riverside, CA and Seattle, WA is seeing his businesses grow because of the increase in commercial refinishing services. “Commercial business is certainly growing leaps and bounds. It’s a great way to offset lower residential business times like over the holidays,” Murphy said. This year, Entrepreneur magazine ranked Miracle Method No. 1 in its category on the Entrepreneur Franchise 500® list. Miracle Method has also been recognized by Franchise Business Review as one of the Top 50 in the 2019 Franchisee Satisfaction Awards. As an active member and participant of the International Franchise Association’s Vet Fran program, Miracle Method has also been named to Franchise Business Review’s Top 100 Franchise list for Veterans & Franchising in 2017.